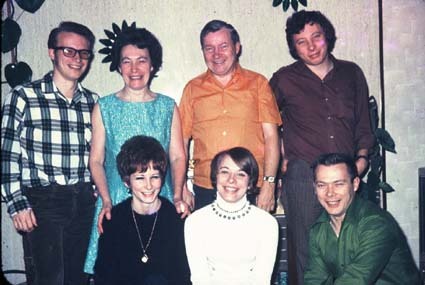 Here are the British Columbia Parretts, gathered in Vancouver, about 1970, for mother's 80th birthday with hosts Stan and Peggy Parrett. Peggy is standing, left, with daughter Pat. Barb and father, Roy, Stan and his sons George and Bob. Seated are Maude, Roy's wife, Granny Mabel Parrett, and her daughter- also Mabel Parrett. The B.C. Parretts about 1970. The photo above, taken about 1968, shows- standing, son Glen, Maude and Roy Parrett, son Ken. Seated are Maureen, Barbra and Vern. Eight "Purchase" cousins in England in 1985. Janet Purchase took this fine historic photo. Your editor Roy Parrett happened to be in England in 1985, so cousins Angus and Janet Purchase had a nice party ay their New Barn Farm residence, near Blandford. 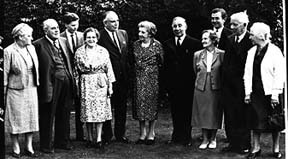 Angus is on the left with Phil Wadge, Kathleen Burleigh, John Purchase, Jean Foskett, Roy Parrett, Joyce Slocock and Kathleen Pike. The Purchase Uncles and Aunts in 1962. Alg and Mable Purchase visiting in England.